Documenting Summer: Patio Party Style! - Pebbles, Inc.
Documenting Summer: Patio Party Style! 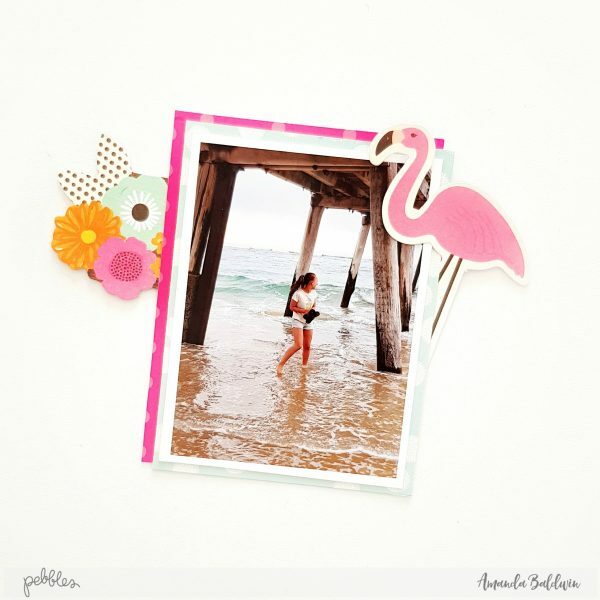 Amanda here, & today I am sharing with you how I am documenting our Summer memories with the gorgeous Patio Party collection from Jen Hadfield! 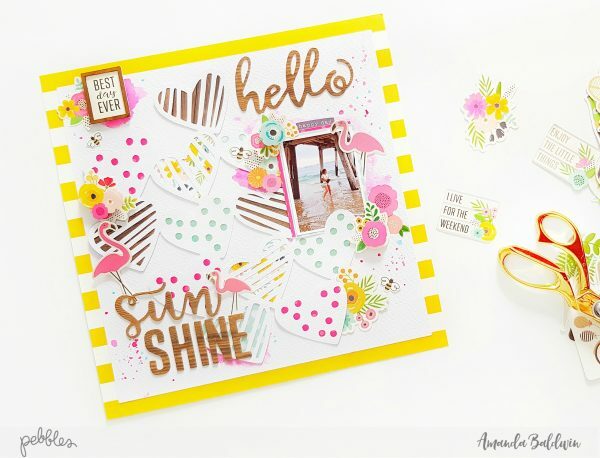 It’s no secret that I am an enormous fan of Jen’s designs, and Patio Party has my heart! All those bright colors just scream Summer FUN! Here’s what I’ve created for today’s post…..
Oh isn’t this sweet for Summer?!! Hearts, tropical colors, flamingos and pretty blooms! Summer Lovin’ at it’s best! And better still, it’s really easy for you to recreate! 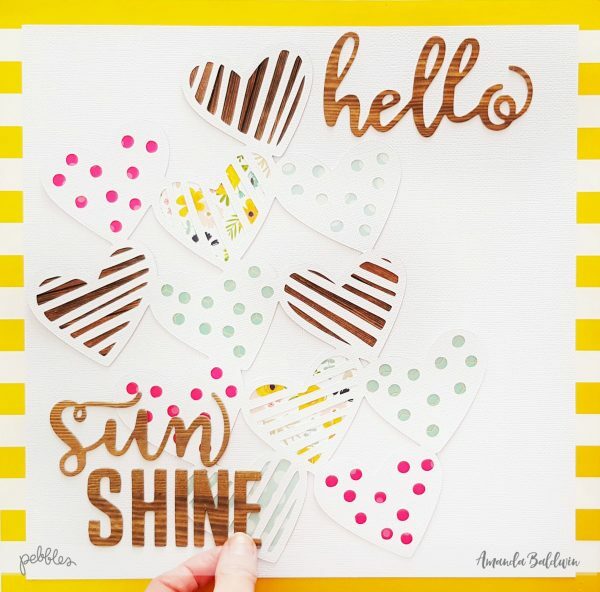 To get started, you’ll need patterned paper, Citrus Sweet (reverse side, with the stripes) , white cardstock, Patio Party Thickers, and a heart cut file or die cut. The one I’ve used today is called Hello Hearts (from The Cut Shoppe), but you could even fussy cut your own hearts out. You’ll also need pattern paper Panels, and the 6 x 6 Paper Pad. 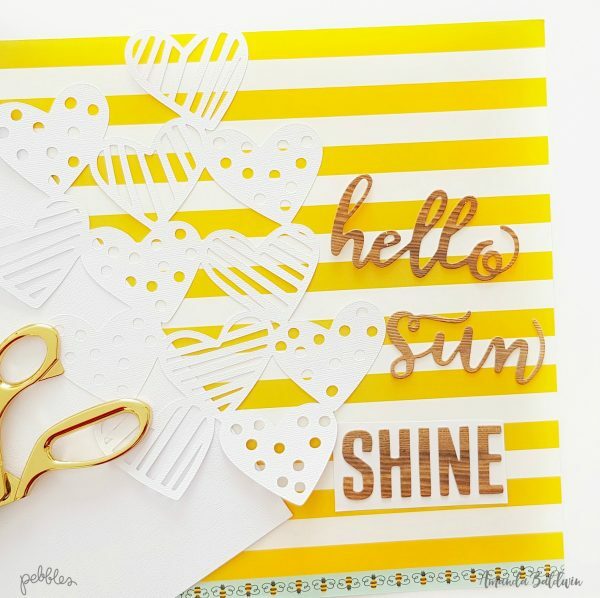 Trim your white cardstock to 11″ x 11″ and attach to that gorgeous striped paper. The stripes on the reverse side of Citrus Sweet are so bright and just give me that happy Summer vibe! 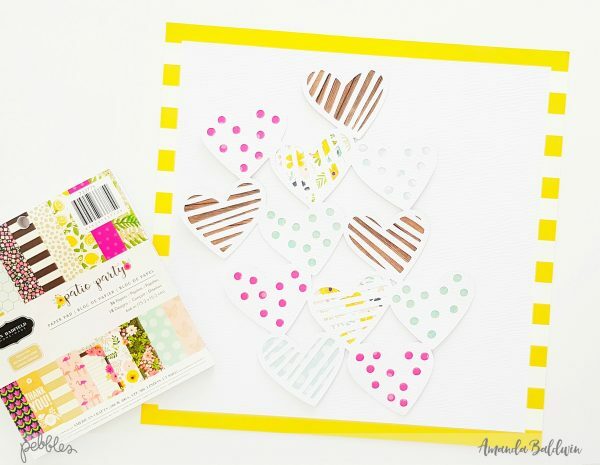 Back your heart cut file with papers from the 6×6 Paper Pad, and the pattern paper called Panels. It’s important to include the woodgrain paper, as it compliments the Patio Party Thickers and creates balance on the page. Glue your paper-pieced cut file to the center of you layout, and then position the Thickers title into place – as shown above. As I am documenting a Summer memory of my darling girl, Hello Sunshine was a perfect title choice. However, if this doesn’t suit your needs, don’t worry! There are so many other words and title options in this set of Thickers; I’m sure you’ll find something that works best! Now it’s time to prepare your Summer photograph! For this layout, I’ve used a 2 1/2″ x 3 1/2″ photo. Using papers from the 6 x 6 Paper Pad, I trim two patterns to 2 3/4″ x 3 3/4″, and layer them beneath my photograph. I attach a flamingo and blooms ephemera, before adhering it to my page. Time to have some fun with embellishing! 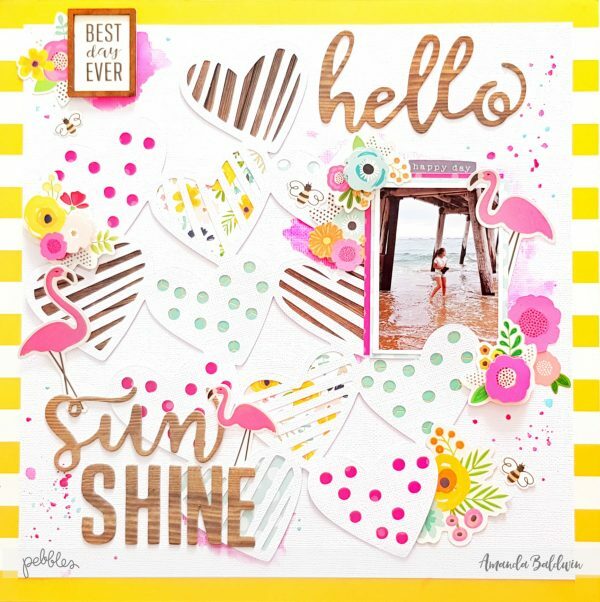 I start by adding that Best Day Ever Wood Sticker to the top left hand side of my page, and popping a 6 x 12 Accent Stickers bloom beneath it. I also created a few embellishment clusters around my photo, using Ephemera, Accent Stickers and Dimensional Stickers. I added 2 more flamingos, to adorn the Sunshine element of my title, and a few more blooms scattered on my hearts. 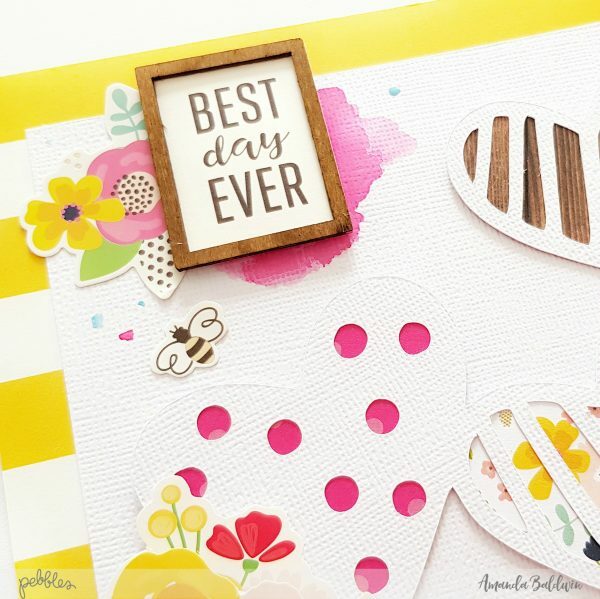 Oh, and don’t forget those 3 super cute buzzy bee stickers – So cute! If you love a really ‘clean’ layout, then this is complete! But if you just need a lil’ more pop of color for your Summer themes, then see below…. With a fine brush & steady hand, apply hot pink watercolor to your layout focal points. Add a few splatters for good measure! I even added a few tiny droplets of that sky blue to balance the colors in my design. And there you have it! Summer memories beautifully documented with Patio Party! Here are a few close ups for you…. Such a gorgeous color scheme! And those flamingos are just perfection! 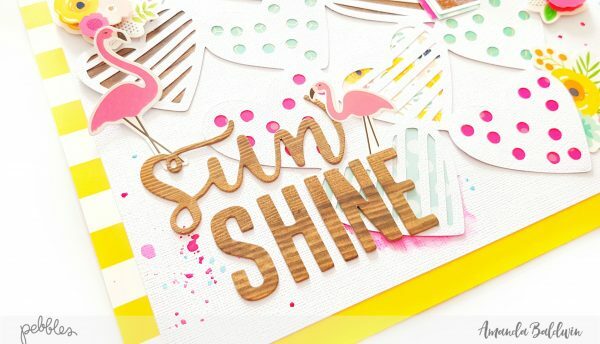 Loving that woodgrain element, especially with the pops of hot pink! I just adore the blooms in that embellishment cluster! I hope I have inspired you to start documenting your favorite Summer moments too!